To determine the inhibitory potency of letrozole and its main human metabolite, 4,4′-methanol-bisbenzonitrile, on the activities of eight cytochrome P450 (CYP) enzymes. Letrozole and its metabolite were incubated with human liver microsomes (HLMs) (or expressed CYP isoforms) and NADPH in the absence (control) and presence of the test inhibitor. Letrozole was a potent competitive inhibitor of CYP2A6 (K i 4.6 ± 0.05 μM and 5.0 ± 2.4 μM in HLMs and CYP2A6, respectively) and a weak inhibitor of CYP2C19 (K i 42.2 μM in HLMs and 33.3 μM in CYP2C19), while its metabolite showed moderate inhibition of CYP2C19 and CYP2B6. Letrozole or its metabolite had negligible effect on other CYPs. Based on the in vitro K i values, letrozole is predicted to be a weak inhibitor of CYP2A6 in vivo. 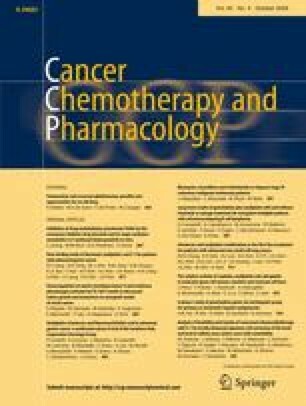 Letrozole and its major human metabolite show inhibitory activity towards other CYPs, but clinically relevant drug interactions seem less likely as the K i values are above the therapeutic plasma concentrations of letrozole. This study was supported in part by a Pharmacogenetics Research Network Grant (U-01 GM61373), which supports the Consortium on Breast Cancer Pharmacogenomics (COBRA), a Clinical Pharmacology training Grant (T32GM008425) and an RO1 grant (1R01GM078501-01A1) from the National Institute of General Medical Sciences, National Institutes of Health (Bethesda, MD), and by a fellowship award to Dr. Jeong from the Research Institute of Medical Science of Chonnam National University, Gwangju, S. Korea.